Wonder Tactics has prepared a special year-end event to sum up the record of 2017! 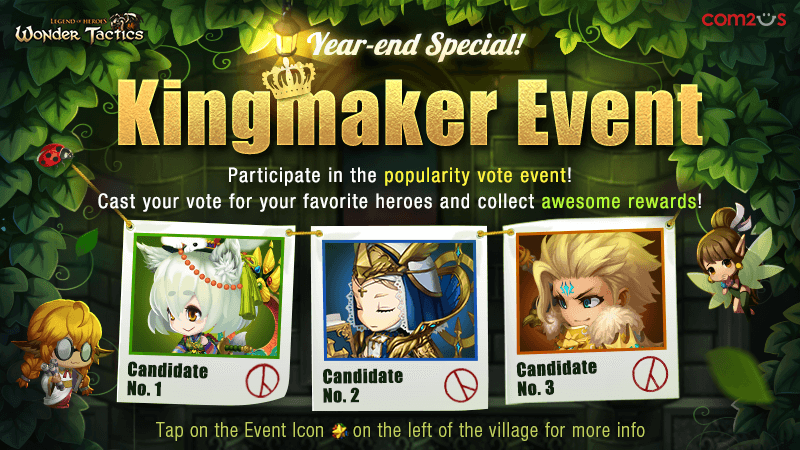 Check out the Kingmaker Event and cast your vote for your favorite heroes! Rewards will be given for the votes you casted every day and according to the rank of the Hero you selected! This is an all-server event so make sure to cast a vote for your favorite hero to make him/her be No. 1! This is a preparation for you to vote! You can get tickets according to the no. of gameplays. ※ Your tickets in possession will reset every day and won't be accumulated. ※ You can use the remaining tickets in the daily bonus event. Cast a vote every day to get rewards! Don't forget to vote! ※ You can get rewards when you cast your vote in Event 3. ※ Each reward is available once a day. Event 3. Pick your favorite Hero! Cast your votes to your favorite Hero to be No. 1 of all! Cast a vote each week (Week 1/2/3)! Keep in mind that you won't be able to change your decision once you've selected a Hero to vote for! Check the results live! You can't know the results until the end! Check results and get rewards! Exchange your remaining tickets for Energy! - This event is only a popularity vote and doesn't have a purpose of modifying the balancing of the game. - Tickets will reset every day so please make sure to use the acquired tickets on the same day as you've acquired them. - For Event 4, rewards will be available after the results of each week is revealed. - For Event 4, you have to participate at least one time in order to collect rewards for each week. You won't be able to participate in the vote for the week that has already ended. - This voting event will be held as an all-server event. - Vote status will be refreshed every 24 hours. - Rewards will be sent to the Inbox. - For questions of customer support, please contact our Customer Support by visiting https://www.withhive.com/help/inquire.